Overall print size: 261/2” x 191/2” high. 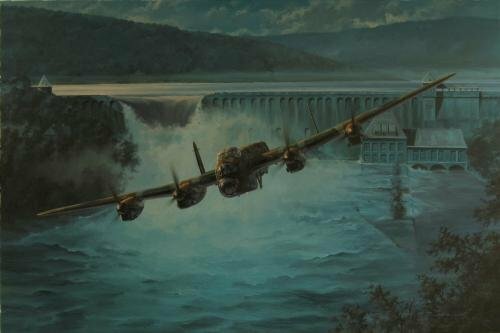 Immediately following their devastating attack on the Mohne Dam, the specially modified Lancasters of 617 Squadron successfully breach the second of Germany's mighty western dams - the Eder, on the night of the 16/17th May, 1943. After hitting the target with pinpoint precision, pilot Les Knight and Flight Engineer Ray Grayston battle with the controls of Lancaster AJ-N in order to clear the high ground beyond the dam as a torrent of water erupts into the valley below them; the wall of the Eder Dam is rent apart and collapses.